The new year is just around the corner, which means it’s time to start planning those all-important strategies for the year ahead. Cue the suspense music and high-pitched shrieking. If, like a lot of SaaS and tech brands, you’ve been too busy working in your business and on your products to even think about marketing, you might shudder at the thought of laying out a content strategy for 2018. Rest easy knowing you’re not alone. But that doesn’t mean you should continue the way you have been. Aren’t you all about innovation and creating something people want and need? That means you have it in you to give the people what they want with your content. In fact, with 89% of start-ups actively using content marketing, you’re going to get left behind in a cloud of dust if you don’t brush off your hands and get to it. In this end-of-year extravaganza of a post, I’m going to deep-dive into some of the top content marketing trends set to hit your industry over the next 12 months. If you’d like to talk about what would work best for your business specifically, feel free to reach out for a consultation. While you’re probably all-too familiar with the inner-workings of AI and what it might mean for your business, you might still be in the dark about how it can help you with your content. Rather than robots creating content, which is what immediately pops to mind for a lot of people when AI and the internet are put together in the same sentence, machine learning and its counterparts can actually help ease the content creation process without losing the human touch of, well, humans. With powerful machine learning solutions coming into play over the next year, you can start mining data and analysing patterns when it comes to your content. Today, tools are able to determine what content is performing best and predict future strategies that will replicate that success. So many businesses duck out of creating content because they just don’t have the time to sit down and write. But, with AI replicating actions that take humans hours or even days to do in mere minutes, that is a worry you can say goodbye to in 2018. We’re not talking content creation from scratch. Instead, we’re talking high-quality email automation campaigns that are more powerful than ever before, content idea generation that takes into account super-specific audience needs, and super-speedy competitor analysis that helps you discover what your target user is lapping up elsewhere. Gone are the days of quickie posts that offer absolutely no value in the slightest. People these days want real relationships with brands, and that extends to content, too. Instead of same-y posts that are thrown up “because something is better than nothing”, we can expect to see brands focusing more time on creating deeper content that offers more. This might mean creating less content, but better content. Rather than seventeen bazillion tiny blog posts a month, companies will start creating in-depth guides, downloadables, eBooks, and long-form blog posts that really help their target audience solve a problem. So where does the “connective” part come in? For years, the internet has provided a digital blockade to human relationships. But now, consumers are wanting more from their time online. They’re wanting to make real connections with brands that share the same values as them, and they want to feel like a part of something. When you can start giving the people what they want and creating these increasingly “human” conversations, you can build a community of users that love what you do and will stick around for the long haul. “But what has this got to do with content?” You ask. 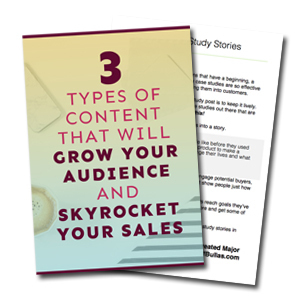 Content is everything when it comes to communicating with your audience. By providing deeper pieces that don’t just scratch surface-level itches, you’re simultaneously sharing your expertise, boosting your authority, and carving out a well-placed position in your niche. Often, your content is what potential users will see first when they come to you, so it’s one of, if not the, most important thing you can focus on besides your product or offering. When you’re reading the word “content” in this post, what comes to mind? I’m willing to bet good money that you’re thinking of blog posts or social media content, right? And you’d be right, but that’s not all it is. In fact, in 2018, we’ll see a curve away from just blog posts and social media content and a move towards a more collective and collaborative approach to content. Despite our digitally-connected age and the ability to find out anything, anywhere, at any time, people still value recommendations from others above everything else. So much so, that word-of-mouth marketing is still one of the most important forms of marketing, and that will continue to be the case in 2018. In a study by Nielson, a huge 83% of consumers trust recommendations from people they know, while a further 66% trust other consumer opinions online. This is why user-generated content is set to become huge. It’s already pretty big now, with more brands than ever choosing to implement content that has been created by previous customers in their marketing campaigns over polished ads and brand-driven content, but it’s only going to become more pervasive. The best part about UGC as a form of content is it can be implemented at every stage of the customer buying process, right from the awareness stage when people start learning about you as a brand, to the sale or download, where they become a valued customer. With benefits including increased time on site, a 50% lift in engagement, and a 10% increase in conversions, it’s no wonder UGC is set to become a firm favourite for content in the tech and SaaS world next year. If it’s reach straight for your phone to check your emails and messages, you’re not alone. Consumers today are more connected than ever thanks to the incredible increase in mobile capability. Now, we can find anything with the tap of a finger, and it’s changing the landscape of content for tech and SaaS companies. Rather than static pieces of content shown only in one place, 2018 will see content spread across different platforms and devices. As well as blog posts on-site, we can expect to see nifty tools like push notifications reach people on mobile, and mobile content cropping up more and more - Snapchat and Instagram stories anyone? At the core of it all, people still want to read stories. It’s a human thing that has been a part of our subconscious for thousands of years since the days of sitting round a fire and sharing food and chatter with neighbouring tribes. Today, that’s the same, but the whole process is made quicker and easier with the help of the digital world. 2018 is going to be an exciting year for content in the tech and SaaS world, partly thanks to the lightning-speed at which AI and machine learning have developed, and partly thanks to the changing wants and needs of consumers. By staying ahead of the game, you’re staying ahead of your competitors. But, more importantly, you’re creating a community for your users and fans that is more powerful than any other marketing method out there. So, if you’re ready to create the content strategy to end all content strategies next year, now’s the time to start thinking about it. If you want to start right away, shoot me a message and we can chat about what these trends mean for you and how you can implement them. Alternatively, if you’d rather have a go on your own, my Create Electric Content program is available for just $39 until the 1st Jan 2018. By the end of the year, you could have your content strategy all set to go so you can kick the new year off with more sales, more users, and more customers.